I think it was 5th grade? Maybe, yes. I would have a “Current Events” weekly assignment. Every Monday the class would have to take an article from the Sunday paper and write a response of one single solitary page in length. It was to be about how this article related to our own life. I always had so much trouble with this assignment. But then again, I had trouble with nearly every assignment in school. Why? Simple, my mind was always other places. Back then my life was Super Soakers, Nintendo games and remote controlled cars. Our course my life is vastly different now from what it was then. Or at least I like to think it is. It’s odd how your priorities change. I’m sure even my priorities of today will again be vastly different 10, 15, or 20 years in the future. At some point my love of video games, water guns and toy cars eventually gave way to guitar’s girls and guns. Kidding about the guns! I’m not a fan of guns. Who knows, maybe when I’m 75 I’ll retire to Texas and own a cattle farm and carry around a big shotgun? Anything is possible. I’m going to say PROBABLY not though. Today my priorities still include guitars and girls, but they also include reading, finance, computers, coffee, tea, beer, and of course blogging. Part of me feels as though I’m either on a precipice of another change, or at the very least another significant addition to my interests and life. So why was that assignment so difficult? Well, my biggest issue with this assignment was the fact that we didn’t subscribe to any newspaper. Why? It’s a long story… but the short version is basically the living situation at the time was 3 kids (me included) and a one parent working and going to school at the same time while also raising those 3 kids. For the most part my Mom raised us. This is NOT to say my dad couldn’t have been around. He’s a GREAT guy! And I have nothing but the best to say of him. It was just the dynamics of the situation at the time. My mom was and kinda still is, a stubborn proud do-it-your-self-er and refused any help from anyone or her parents. So here we were not able to afford even lunch (we were on the free lunch program in school) yet we have grandparents that drove Mercedes and lived in the California next to celebrities (see yesterday’s post on celebs). Not that I entirely disagree with trying to make it on your own. But accepting help sometimes is ok too! Anywho, so in order to get the paper we relied on left-overs from neighbors and family friends. Not food, just the Sunday paper. I wouldn’t trade the experience for the world. It’s made me much more humble. Yea maybe it wasn’t the best way to go about things but she didn’t do too bad of a job teaching us the right morals and work ethic. At least I think that’s what she was trying to prove. Something to the effect of that just because there are things available to you doesn’t always mean you should take them. You should def try to go out on your own and get them for yourself. This is a much more rewarding experience I think. And I’ll disclose that the Cali lifestyle lived by my grandparents was as well the product of TONS of hard work and core ethics of saving and living wisely. So sometimes you don’t always have things available to you and it takes a slight bit of extra effort to get the same thing that someone else might have more readily available. That’s the thing. For one person just getting up in the morning to make coffee takes all the energy in the world and this will always change throughout your life as well. What might be easy, OR hard right now could eventually reverse and most likely will. Or as was my case in 5th grade just obtaining a newspaper wasn’t easy. Let alone having to write the article itself. Yet when I would come into school that next morning the teacher had no way of knowing all the work that was put into each kid’s article. He simply graded on how well the assignment was done. Some kids, I’m almost positive either had the articles entirely written by their parents, or they were 50 or 75 percent done by them. This is one of the things about looking at others in life. We don’t look at them and think about where they are starting from or their handicaps. We just think about how WE do it and how easy something might be for us and that we don’t understand why this person is having such a hard time with something that should be so simple. This happens a lot with computers and myself. I’ll often not understand why someone doesn’t get a concept. Only after taking a step back and trying to see it from their shoes do I get a better picture. So what I’ve learned from reflecting back is to keep an open mind and know that everyone isn’t starting from the same spot. Some people start from an extraordinary advantage where others have extreme disadvantages. I recently read the first 2 of 3 books in The Hunger Games series and this was a prominent theme throughout. Those who are extremely disadvantaged and those who are extremely advantaged living in completely isolated worlds. Worlds, LITERALLY isolated by giant electrified fences. The answer to that question is… most of the world. The most popular device on the planet is actually the mobile phone. Not the computer, and not the tv, and not even the automobile. This clip is pretty long. But if you have time it’s a good watch. I’ll be honest. I’m enjoying it. I really am. I even got up enough guts to say hello to the pastor and shake his hand yesterday on the way out. He asked if I had been there before and I said it was my third visit. He said he’d be interested in talking more with me if I felt up to it next week. I said ok, sure why not? This was the part that really interested me. This actually wasn’t part of the main sermon/teachings of the day. This was an afterthought that was mentioned that had to do with a trip this summer they are taking to Uganda to help with distributing medical supplies and food. This came up because the pastor was re-telling a story of just this past weekend where some kids went on a retreat (I know of retreats from where I work, but I don’t know if they are the same kind of thing. I’ve never done this sort of thing myself, I only know of what it is.) While on this one of the nights they gave the kids only rice for dinner. This was to show that in some parts of the world kids receive only rice for nearly every meal, if they are lucky. He said they later had a pizza party that night. The idea was to let them believe they were only going to receive just that small bowl of rice for that entire evening. It’s a pretty bold way to make a point. Much the way my mom refused help as much as she did from her parents during my youth. But I’m sure it will leave a lasting impact on the kids. That story more than anything else I heard yesterday got me thinking for today’s writing. The world. How lives are vastly different not years ago from today. But instead of spanning time, spanning geography and culture. As of right now I sit writing this on my 2 thousand dollar MacBook pro in Cosi while drinking a cup of coffee and eating a sandwich that I paid 10 dollars for. I can only imagine how many mouths my MacBook pro ALONE would feed in many parts of the world. If anyone who reads my blog regularly remembers there was a post a while back with my favorite educational and academic video websites. One of these sites is Fora.tv, which is the site that hosts the video mentioned above. That site often has videos relating to distressed parts of the world where people live in sometimes pretty dire conditions. Free rice has been around for a few years now. The goal is to donate rice in exchange for correct answers by the user to vocabulary questions. They also have many other topics now. Large corporate donors who display ads on the page pay for the rice. I’ve just been thinking a lot about current events and about those in the world who live lives vastly different from how I live my own. They all have priorities. Again this point is driven home MANY times by the main character Katniss in The Hunger Games. She will often speak of how vastly different her world is compared to those who live in the capital. My take on the series is that each of the districts really represents a nation or group of nations around the world. And that District 12 along with the other impoverished districts is most likely meant to represent any of the countries living in third world conditions. The capital is perhaps representing America? So what was the precipice of change I alluded to earlier in this post? Well I find something very spiritually filling about attending church. Not to say I’ve finally found what I’ve been looking for all my life. But It’s definitely changed how I feel about priorities. I think maybe spiritual direction has just as much importance as finances, music, girls, and toy remote controlled cars. What has started more as an experience for music has affected me much more substantially than I had anticipated. What really does interest me is that everyone who attends seems truly genuinely happy to be there. I like that. If nothing else then I believe in the feeling that comes from this. There’s a feeling of community for sure that you can just pick up from the vibe of everyone there. Again, not that I’m saying I’m making any choice on anything about religion. But there’s a possibility that I might end up continuing to go after I finish the song I’m working on. If not to this place explore other churches. So what I’m trying to say is that there is a lot going on in the world that I feel I haven’t been paying attention to. There are so many ways of living that I’ve completely missed and all of it I believe from Uganda to the local church has significant value that I’ve been over looking in my life. So what I’ve decided to do every Monday in honor of my 5th grade assignment is to write a response piece to worldly current events. So come back next Monday for a current events reaction piece. Change is always around us. You’re Famous! Let’s do lunch. I know, I should have done this post 2 weeks ago for the Grammy’s, and then should be posting something about the Oscar’s tonight. I apologize for the delayed posting of this. But the Grammy’s happened before I started posting a blog a day! So… how about this… I’ll do something special for you my blog readers… ready? Yea… that’s the skit. I think that’s actually pretty neat in that clip with the words and all animated to it. Ultra creative! My hat goes off to whoever made that clip. Any who so this, my blog reader friends, is a 2fer JUST for you! So in honor of the Grammy’s two weeks ago and the Oscar’s tonight I’m going to talk musical artists and celebs. Or mostly just 1 musical artist and 1 celeb. I was thinking about these two award shows. My first thought was I SOOOOOO want to be on these. I think my biggest dreams in life are to be a real musical artist and as well I’d LOVE to be an actor on a TV show, preferably something comedic in nature. Anywho my second thought was about meeting celebrities. One of my friends who resides in LA actually had a legit celeb spotting the other week… guess who the celeb was? I think Moby is an interesting dude and I wonder what it’d be like to talk to him. Dr. J: He’s a B-Ball player who used to play for the 76ers. My sister went to camp with his daughter and so one year they had a reunion at his house. It’s a pretty massive house and I got to go and hang out at his house and shake his hand and shoot some hoops with his kids on their very own court. It was neat. As well they had an arcade in the attic so all the kids went up there and played arcade games and since I was a kid, I went with all the other kids. Kyle Massey: He was on a show “that’s so raven”. I met this dude cuz my next door neighbor is his personal acting coach. So Kyle got invited to a party at their house and I got the invite too. So I got to like stand next to him and eat chips and salsa and say “sup”, “not much, sup with you?”, “not much”, “that’s cool”. But then again what else do you talk about? Parker Posey: I was just an extra in a movie with her. It was cool. I’m working on the blog post about this. 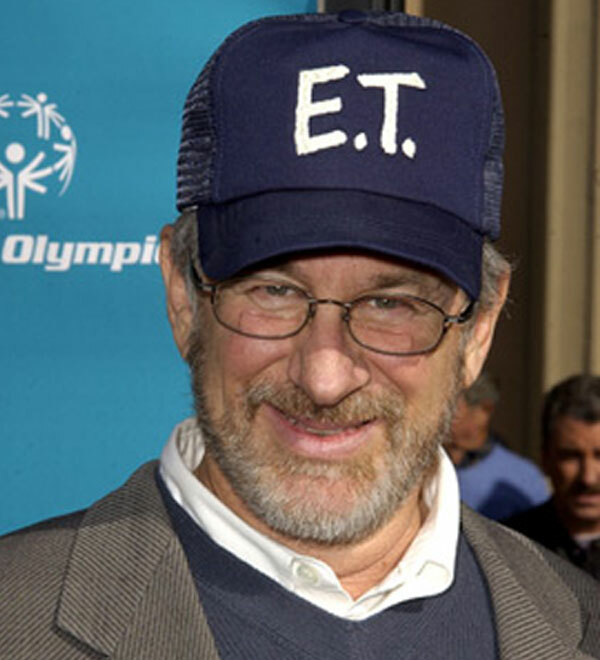 Steven Spielberg: Went to summer camp in maine with his kid. I got to meet him at the end of the summer when he came to pick up his kid. It was like… whoa… you’re Steven Spielberg! He was like “hey”. As you can tell my depth of conversation is lacking whenever I meet these people. Chelsea Hertford: She’s the littlest one in the show “Major Dad”. I was in first grade with this girl. Honestly… I remember very little of this. I just know I have a class picture with us in it together. The Gin Blossoms: I got to talk with these guys because they came to play a free show at IUP. The power blew and without any power they decided to come down into the crowd and hang out and talk. There was free popcorn so we ate popcorn together. When power was restored they finished their set. So yea, I’ve met my fair share of famous peeps. There’s more, but those were just the first few that came to mind. Yep. Can you tell where the chorus for that song came from? Yep. I think she’s a fantastic songwriter. Never have I seen a songwriter put what seems like their entire heart into their work. I think she’s just an amazing woman and her biography is pretty interesting too. She definitely overcame some very bleak times in her life to get where she is. I think as well from what I’ve read and just the way she carries herself on stage, she would be a VERY personable and GENUINE human. I don’t think there would be a fake bone in her body. She just seems like a completely honest and awesome person! I’ve liked her music for as long as I can remember discovering her. I used to listen to “New Beginning” on repeat when I first got my hands on it. But the songs on all of her CD’s are just raw emotion. This woman is writing songs from maybe more than the heart… maybe somewhere deep within herself and her soul, no doubt. She is writing songs from her soul’s inner core. She writes as an outlet and not as a way to make a quick buck. If you listen to the messages in the songs they are full of hope and inspiration and just raw passion! There is just something different about her from any other musical artist that inspires me. I’d love to have a conversation with her and listen to what she has to say on life. Along with her passion for music, she has a passion for giving back… she performs often for charitable causes involving both poverty and AIDS. Tracey Chapman, you inspire me as a person and a musician. I’d love to meet you one day. Ok so the second part an Oscar winner… Actually this one is a little less inspiration in nature and more someone that I think would just be fun to chat with! Although don’t get me wrong, I think she’s a great hardworking inspirational person too! But… well… let’s face it. I had a crush on her since I first saw speed. I don’t know what it is about her… but she’s just magnetic! I love her vibrant personality and her smile and her energy and let’s be honest. I still have a crush on her. She’s a fun actress to watch in any part she plays no matter the movie. As well she’s a generous and giving person too! Sandra Bullock. I’d love to do lunch some time. So there you have it. Those are two famous peoples I’d like to hang out with and have a convo with and really get to know on a personal level. What about you?!?! What celebrity peeps would you like to meet and really get to know? I’ll be honest... there’s just sooo many choices that I had the hardest time picking. There are so many others I’d love to meet. I’m happy just sharing my life with everyone I know that isn’t a celebrity! Every person has value no matter what they are doing in life. I love sleeping in. Sleeping in just makes me happy. Almost as happy as that song makes me. I don't think that's the official video for the song. But I do like that video as well. So here's my theory on me and my sleeping in. 1. I was born in California. When I sleep in, I generally will naturally sleep till about 12 noon without the influence of an alarm clock. In Cali time this is 9am. Which would probably not be considered sleeping in. Here's what I think: My body is still naturally stuck on west coast time zone and that I naturally like to wake up at 9am. Maybe there's a lesson in there... try not to deny your past or roots but try to figure out a way to mesh them into your future? Much like there's probably some sort of great symbolism going on in that video with the red string in the woods? I'm not the best at interpreting symbols. And it's a Saturday. So i'm going to go easy on the whole deep thoughts thing in this blog post today. 2. Here's my other thought. When I sleep in, I generally sleep 10 hours. Actually 10 hours seems to be my natural sleep cycle time. So last night I went to bed at 2am. My plan was to go to sleep early, but I always fail at that. But maybe I just need 10 hours sleep. However since I'm so bad at actually going to sleep early yet I need 10 hours of sleep a night sleeping in is the best option for me. And for when I don't have ample sleepy sleeps time... There's a magical thing that exists called caffeine. It comes in many different forms and it's very amazing. So I am very thankful for it's existence! I'm just glad I get to sleep in one day a week at least. Some weeks it's two days a week. I suppose I have something to look forward to in retirement? I plan to sleep in every day. Although, everyone I know that's over the age of 65 gets up at 4 am and goes to sleep at midnight. Maybe their plan was to sleep in everyday when they were my age once they reached that age? Although maybe i'm one of few people who just seems to require sleeping later or more sleep. Not sure. So tomorrow I'm going for my second church visit. Now the good thing about this place is that it's at 5pm. THAT means, wooo hooo... I can still sleep in! They have earlier services and i've been fighting with my thoughts as to should I attend an earlier service. The problem with the 5pm service is that there aren't many people there. I stick out like a sore thumb. OBVIOUSLY i'm one of the few people there that doesn't come regularly and everyone can tell. this isn't that bad. But I just think maybe if I went to an earlier more densely populated service I'd feel a little more comfortable and i'd be able to focus more on things? Like with every decision there's always the pro's and con's to weigh. As long as the pro's win out over the cons, then I think it's an OK choice to go with that option. You'll never get 100 percent pro's on anything in life. At least that's my findings. I just try to go with what best fits and feels comfortable. Ya know? 1: Memorize 2 Corinthians 6:14... I don't even know what that is?!?! A little help? Memorize?!?! Can't I just read it off my iphone? I have a problem even memorizing my own songs for live shows... that's why I play live with a laptop with the lyrics on it. Let alone memorize an entire Corinthian... let alone TWO of them!!!! At 6:14 AM? Or PM? I'm confused. What is a Corithian? 2. Attend next three Sundays of the "Mayhem" Series... Ok I got that one at least! Or, that's my plan. Last weeks lecture/class/sermon... whatever it's called was actually pretty good. It was on relationship road hazards. 3. Invite someone to attend church with me next week. Yea, I tried this... no takers. Anyone who reads this blog want to go with me tomorrow?!?!?! Hello? No? sigh. It's ok, i'm supposed to be doing this alone anyways. That's the plan. But if anyone's interested i'll buy you a favorite dish at your favorite resturant or cup of coffee or something. Anywho, just let me know yo what the dealio is fo ta-marrrow (that's the philly accent). So 1 out of 3... that's what 33 percent? Crap. I failed. 33 percent is def not passing. I need a tutoring. No... not the kind you eat... the kind you have on your body... or in your body? This is somewhat of a follow up to yesterday's post about running... So... continuing on with the fitness theme. There's a scene when the next door neighbor's kid (Thomas Wilson Brown) is working out. And the dad (Matt Frewer), I think says, "When I was your age, I put on twenty pounds of pure unadulterated blitz-the-quarterback-and-rip-his-head-off muscle, Russell!" or something to that effect. It stuck with me. So now every time I see someone with any sorta "beefy machine gun tanks for biceps" thing going on I think of that scene and line from that movie. So... i'm a dude who really doesn't have much muscle mass. 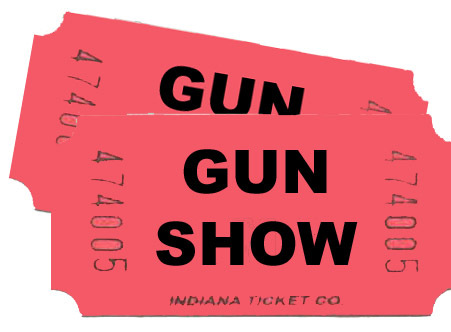 Ok, honestly, I never have really ever had any of these so-called "guns". I mean I think maybe once or twice in my life i've tried to bulk up. Even one of the times was on accident, because I was playing drums a lot and if you play a lot of drums you tend to get a little bit more muscular. Think of every drummer you know... for the most part, all of them have some kinda gun action happening, right??? I mean look at the GUNS on that guy! I DO NOT want to pick a fight with this dude. NO WAY JOSE. You go ahead and pick a fight. But i'm not. I'll watch. JUST LOOK AT HIS FACE!!! He's ready for a rumble. and then maybe a nap after. 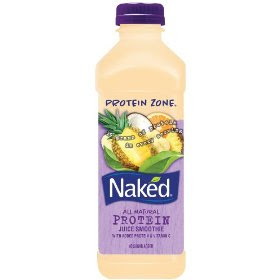 Normally I'll buy one of these Naked Juices every few weeks or so. Especially the power C one when i'm feeling sick, but never the protein ones. Because normally i'm like what do I need protein for? This stuff is for body builders and it just never interested me. Well... on a whim I was like what the heck? I'll buy it and try it out. 1. It's kinda expensive. It's like 4 bucks a bottle usually! 2. I think it's loaded with extra calories. Not to mention all that protein! Not that i'm a nutritionist or anything, but I don't know what this is going to do to my body drinking it on a regular basis.... but I can't stop! 1. Riding my exercise bike more. I've been riding for years... but I usually only did it every few days. Now i'm doing EVERY day pretty much no matter what. I have a stationary bike and I like to read and ride. Or watch episodes from TV shows streaming on my laptop while riding. So when my boss asks me about the latest episode of family guy that I missed because I wasn't paying attention to the time it was supposed to be on TV. I can watch it online and still be prepared to laugh WITH him instead of be laughed AT. Oh, small piece of advice: I know the phrase is Laugh WITH instead of laugh AT... never laugh AT your boss... you probably won't have a job for very much longer. Unless he's a comedian and he tells jokes that you are supposed to laugh at. In which case you'd be laughing at the joke... not the boss. Laugh WITH. Got it? Ok cool. Ok, moving on to numero dos as in dos equis. AKA two. 2. Pumping a little iron. I bought some free weights last year and I used them a little here and there but decided to start using them a lot more in the recent weeks. So this is an experiment, in a way. Let's see how buff I can get! Who knows... maybe the next time you see me I'll be able to bench press your cat. Or dog. Or goldfish. Or at least pick up the bag of goldfish from your counter without straining myself. If nothing else... at least i'll be able to help people move furniture around easier. Or carry groceries for old ladies. etc. Now, of course, this is me we're talking about. I'll probably look exactly the same even 6 months from now. But i'm gonna challenge this. Maybe i'll take a picture of my "guns in progress" every day for 6 months and then compile them all into a movie of 10 photos a second and post it to you tube to see the progress. So, yea, no running for me in the winter. It's too freakin cold. But once it gets warm out. I like to do my thing. Where do I like to run? I apologize for the uber small picture... it was the best I could find on short notice. So, where and what is that you ask? It's called Valley Green. I work across from it and it's one of my all time favorite places I've ever encountered. It's part of the Fairmount Park Philadelphia's Park System. They have running trails galore. So... ok i'm not a traditional runner. I don't have all the legit running gear that all the pro's have. Here's what i like to do. P.S. Actually I don't ever hide in the woods... that's creepy. P.P.S. Also I don't sing out loud in the woods either... that's also just plain weird. Well, now that I've officially made everything awkward here... moving on. Ah yes, in the middle of the park is a restaurant place. There is seating by the creek outside. it's always very nice and everyone always looks like they are having a good time. I just can't wait to get on my running shoes (I don't really have running shoes, I just use the shoes I wear every day) and hit the trails under the warm sunshine. The BEST part about this park is that it's all free for public use! Also there are MANY parking lots provided and parking is ALWAYS free! So it's usually easy to find somewhere to pak ya ca... or for those NOT from bean town... park your car. I'M HAVING YOUR BABY!!! WHAT?!? How was i supposed to know you had a pet giraffe when you were a little kid that ran away?!?!? That's SO unfair of you to hold that against me! I was just joking! Sick compy? Here’s a few tips. As you know... by day i'm a computer nerd guy guru at a college. By evening... i'm probably still a nerd... but I turn my efforts towards being creative and writing music and attempting other things. Like writing blog posts. Or playing with construction paper and trying to make funny videos... but never seeming to come up with anything good. One day i'll get the whole video side of things happening. I also write lots of short stories, but those haven't made it up here either. So we'll just say, I'm an idea man/ music guy/ computer tech wiz person. I also like to use "..." a lot. I should start a "..." club. I've decided to show everyone the "secret" or AKA "special sauce" that I pretty much use for nearly 95 percent of all computer problems I encounter. For the other 5 percent of problems... well... let's just hope those problems never happen... while they can be fixed, it usually requires calling in a professional. So, if you have a sick PC and it run's on Microsoft Windows operating system, here are a few of the best ways to fix it on your own. I'm going to try and make this as plain English as possible, at least in the beginning (some of the later fixes get slightly more technical). If you have a Mac... two words: apple and store. If you have a linux machine, well, you probably already know way more than what you could possibly read on here. So yes this is for anyone who knows maybe just enough to get by and is willing to give it a try (ooohhh that rhymed... I should write a blog one time entirely in rhyme... poetry and prose. Maybe I'll try that in my next entry!). This is for pretty much any basic issue where some window won't close or spyware/malware/virus issue you might ever have. And some other basic problems too. Most of you know how to do a normal restart as in the video above. I'm not talking about just hitting the start button and then hitting reboot. This, or just hitting the power button and then turning it back on again once it's been off for 10 seconds. This is something else. let's talk about 2 things here. 1: If the LED is not GLOWING... the PC might not even be on. That could be your problem right there. 🙂 ok, that's just me being a smarty pants... Sorry! I know you know how to turn a PC on. Ok. So second thing 2: This is called FLEA power. Don't ask me what it stands for... just listen, i'm sticking with the KISS principle for this entry. FLEA power is the excess power left inside the PC once you turn the PC off. Ok so, even with the PC off there's still little bits of, we'll call it, "ghost data" stuck inside the PC. Here's what you do to clear it ALL out and scare away all the ghosts. 1. Turn the PC off. IF the PC is "STUCK" and won't power off. Just hold in the power button until it quits, or makes that sad robot sound of a robot powering down. If that didn't work, yank the cord out. If the PC is STILL on... it might be time to call a priest. 2. Unplug it completely (if there's a battery, remove that as well) This is slightly redundant... but just make sure there's NO power source going to it. 3. Hold the power button for 10 seconds... use Mississippi's in there when counting. 4. Reconnect the power button, and battery if you had one of those. 5. Power it back up. That fixes something ridiculous like HALF of all computer issues. Don't ask me how it works or anything like that. As I said, ghosts... inside the PC.... need to be scared off. PLAN B: JUST KICK IT A FEW TIMES. DON'T FREAK OUT! Just stay calm and contact a professional PC repair dude such as myself. PC's are machines and lines of code and just one proccess firing off in sequence one after another... They break because something fails to happen in that chain. Just like a line of domino's if you replace one or break one or move one... the whole thing will stop at that point. This is what a blue screen generally is. Computers are NOT possessed by satin. They don't have minds of their own (yet) and they aren't TRYING to ruin your day on purpose just to get back at you for not being around enough like cats do. Cats are MEGA witty and mischievous little balls of fur, but we can't help but love em! Just stay calm. When something has gone awry. Nearly all computers issue can be fixed. Everything is easy when you know the answer! It's just a matter of using troubleshooting skills to find that answer. 1. Toolbars. Toolbars are the WORST. They consume system resources and track personal information and SLOW down PC's like no other. They cause MEGA issues in browsers especially after an update has been run. Most toolbar companies are EXTREMELY lazy about updating their products to update with bug and patch fixes that come through on windows update. STAY AWAY FROM ALL TOOLBARS IF YOU CAN! 2. File Sharing programs... ok first off... it's illegal. Obtaining software that doesn't say in the software agreement THIS IS FREE TO DISTRUBUTE is yes illegal. As well so is downloading music, tv shows, movies... from those sites. Copyrighted material took a lot of time to create and produce and write etc. I am a songwriter and I give my stuff away for free. But trust me. Most people want to get paid for their work. All that good TV and music and movies you consume takes more effort and creative energy than you can possibly imagine! Also... it screws up your PC if you get it through file sharing... so it hurts you too! OK... i'm off my box of soap now. Sorry abouts that! just don't be a mooch, instead, find someone to smooch (I made that up myself). 3. Have you installed anything else that you REALLY don't need? Those silly "insert smiley faces into your emails" programs? Anything else? Just be attentive to what you are clicking accept to. This program works wonders. it's free too... So... if you don't already have it installed. Go over to www.malwarebytes.org and download it and install it. You can even just do the quick scan and it should find most of the junk that might be causing your issue. DL that shtuffs. Install it. run it. That's a video on how to, I think harry potter is giving the tutorial, although that isn't confirmed (it sounds like harry potter). Also I didn't screen the video... so forgive me if there's anything in it lewd or annoying or he moves too fast. I just kinda skimmed. You probably have some files "Stuck" inside of windows. Again, i'm not going to go into all the reasons that files can get in effect stuck... but it can happen. One of the best ways to clear stuck temp files is to boot off a rescue disk and clean out the PC using the clean windows junk files option. Just choose the clean ALL junk files and then hit "Y" after it scans. Head over to http://trinityhome.org. And download the what's called an ISO file. Burn that ISO file to a CD using your favorite burning application. There is a free application available on a site called portable apps (www.portableapps.com) they have something called the Infra Recorder. That lets you burn ISO files as well. F12 should get you the boot device list so you can boot off the CD. 3. your just bored and wasting time reading my blog. Basically boot off the disk, make sure the PC is HARDWIRED into a network connection and let the thing run it's course. When it's done remove anything it detects. This thing will removed tons of virus's more effectively than any windows "in os" antivirus because once you load up windows you effectively lock files in place and so you can't ever scan and remove every file. it's like this: If you clean an empty dinner table... it's a lot easier than trying to clean a table at which people are currently eating. All antivirus programs run while the computer is doing it's thing... so it's like that annoying waiter/waitress that comes by to grab dishes from you at a restaurant even though you are still eating!!!! Bit defender is like the server that waits till you pay your check and leave to come and clean everything up. Make sense? Kinda? Maybe? OK. I like the live rescue disk from Bit Defender the best because it seems to be the most effective. It's the file that ends with "ISO" and it's the one that's pretty large in size, like a few hundred MB. I present to you my newest song... "Outlaw Lover"
I was going to write a whole big long blog post about how this song came about and the meaning behind it all and how it’s supposed to be interpreted. But, instead, I’m just going to leave it up to you: the listener. Let your imagination wonder. Just listen and enjoy it for what it is and make up your own meaning for it. 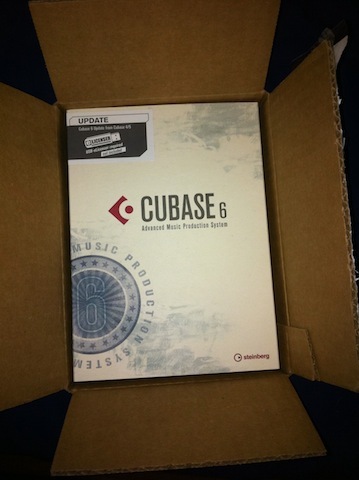 Cubase 6 has arrived in the mail! So I got the new version of cubase in the mail!!! I'm VERY excited to load that onto my Macbook Pro. The new version has a few cool new features that I'm excited to play around with. I decided that I'm going to wait to upgrade from Cubase 5 to Cubase 6 until after I've completed my new song. I'll be uploading the song to my site this Sunday! I'm very excited for everyone to hear it. I think it's one of my most favorite songs I've ever written. Oh and for those of you who may not be interested in music recording software watch the video anyways, it's guaranteed to give you a chuckle. 🙂 I'm almost ashamed to admit that I use this program. The promo video is the single most cheesiest thing i've ever seen in my life... it had me cracking up the whole time. Especially every time that dude winks at the camera. Oh gosh. It just had me on the floor laughing. It's almost as funny as that show An Idiot Abroad. Watch for the cat on his lap.... That's my favorite part... oh and ricky's face on the cell phone... remind me to send a picture like that to one of my friends one time. So this is a fan participation blog! I'm starting to brainstorm for my third professional photoshoot. Nothing is set in stone or anything yet... I'm just trying to do something new and original for the shoot. I was thinking I want to have maybe 15 photos in a row tell a story. Ive decided to call it my storyline photoshoot. I have a few ideas already but I need feed back! If anyone has any ideas feel free to email me at kenny AT kennywestmusic DOT com (I wrote it like that so them spammers peoples won't scam and spam my email). Boardwalk location, so maybe one of the jerrrrrrrrsssssssey shores. I want to make some sort of inanimate object come to life in the scene and interact with me... ie maybe a balloon or something. Or have something chase me and then hide from me etc. Comedy. I want it to be very slapstick 1920's vaudeville type of comedy thing going on. I want the pictures to be color modern day still frame versions of old black and white silent movies. I want to wear some sort of costume or something interesting. Anything else anyone can think of. So that's what I have so far. Anyone who has any idea... feel free to help brainstorm! I know it's not much, but I want to wait till maybe summer time to do the shoot so I have plenty of time to come up with something good! P.S. stay tuned for a new song hopefully this weekend! How FREAKIN COOL would it be if we could transmit smell over the Internet!? I’m not talking about picking up a scratch and sniff card in your local supermarket then visit website X to play along. Square number 12 goes with this smell. No, I’m talking about smell EVERYWHERE online! Attached to the computer screen would be this little odor emitter much like we have sound emitters… or as most people call them “speakers”. Just as sounds are reproduced, scents would be reproduced. Think about all the different places this could be used. Just with shopping online even! One can only imagine: Teas, coffees, food, perfumes, and colognes. Think about how great this would be for looking up recipes. You can actually waft the deliciousness of a dish before you go out and buy the ingredients. Or if you are thinking of taking your family out to dinner on family fun night you can smell the aromas of all the wonderful different dishes the restaurant has to offer! Wow, I could really get carried away with this. Think about just shopping for candles, or flowers! “Oh my heaven that one smells absolutely magnificent.” Click… buy. Goodbye “scratch and sniff” hello digital scents! Mmmm Ooooo, ahhhhh!